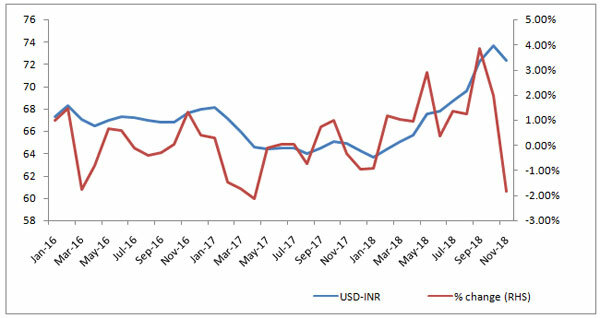 Brief: Indian rupee has been appreciating against the USD at a faster rate over the last two weeks, reaching a two-month high of 70.65 in the fourth week of November. Appreciation in the Indian rupee will give leverage to the RBI in accumulating forex reserve, which will in turn positively impact the domestic liquidity. In other good news, fall in crude oil prices will lower India's oil import bill by $4.56 billion in November as compared to the previous month. Indian rupee has been appreciating against the USD at a faster rate over the last two weeks and has reached a two-month high of 70.65 in the fourth week of November. It is noted that the currency pair had dropped to an all-time low of 73.99 in September 2018. Appreciation of Indian rupee will give leverage to the RBI in accumulating forex reserve and thereby positively impact the domestic liquidity as well. 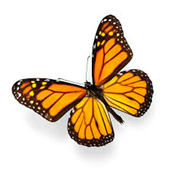 The movement in the currency pair is primarily driven by crude oil price and net capital outflows. In October, 2018, crude oil price had reached four year high of $80 per barrel. In rupee terms, the price was Rs. 5,897 per barrel. However, with the soften oil price and appreciating domestic currency the oil price has dropped by Rs. 950 to Rs. 4,946 per barrel. As per our assessment, this will lower India's oil import bill by $4.56 billion in November as compared to the previous month. As crude oil imports account for around 30% in the overall import basket, higher oil price was widening India's trade deficit and thereby adversely impacting the rupee. Similarly, Emerging Markets are experiencing higher capital outflows as a result of Fed's withdrawal of accommodative monetary policy. However, with softening US inflation rate along with the stabilization in the unemployment rate, the market is expecting stability in Fed's monetary view. Therefore, net capital outflows from the US have turned positive for first time in September, 2018 in a six-month time frame. This gives a sense of improvement in the value of the domestic currency (Rupee) and overall domestic liquidity condition in the emerging markets.